Identifying snakes in Minnesota isn't as difficult a process as in many other states, because relatively few species live there. A total of 17 species are known to have called Minnesota home at one time or another, although one venomous snake might no longer exist within state borders. While two types of venomous snakes are found in Minnesota, both are relatively rare. They're also quite easily distinguished from one another. The large, thick-bodied timber rattlesnake can reach 5 feet long. The yellowish body features light-bordered black bands running its entire length. The bands end at the black tail, which in turn ends with a tan rattle. The much smaller Massasauga rattlesnake matures at just over 3 feet. The gray body is adorned with dark blotches that develop into bars near the tail. While the timber rattlesnake is threatened, it's quite possible the Massasauga no longer exists in the North Star State. The redbelly, topping out at 10 inches long, is the smallest of Minnesota's snakes. The brown- or gray-lined snake, about the same size, has a white or yellow line running down the back. The ringneck snake, a dark snake with a yellow or orange ring around the neck, doesn't grow much longer than 15 inches. The brown snake, maturing up to 18 inches long, is one shade of brown with a lighter shade down the back and small black spots on each side of the back stripe. You can't mistake the smooth green snake for any other species because of its bright green skin. This snake matures under 2 feet. You might spot two types of garter snake in Minnesota. The brown or black eastern garter snake ranges between 1 and 4 feet in length, with a yellow stripe down the back. The plains garter snake, about the same size, can resemble the eastern garter, but some are olive green in color, with two rows of black spots on the body. 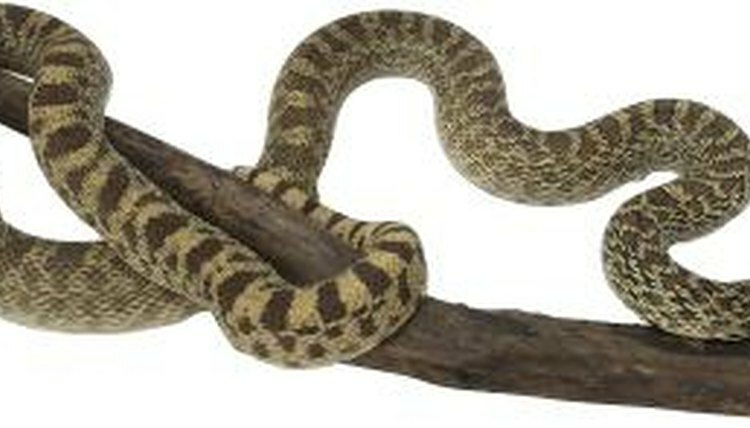 The heavy-bodied western hognose, maturing at about 3 feet, is brown with darker brown blotches and two rows of small spots on its side. The somewhat larger eastern hognose has a completely different appearance, with a yellow body and dark spots, which become rings near the tail. The slender-bodied milk snake ranges in size from 2 to 4 feet, but its color pattern differs. Some have gray bodies with red blotches, while others are primarily brown. The northern water snake also varies in appearance. About the same size range as the milk snake, the northern water snake is usually brown with red blotches. The bullsnake, also known as the gopher snake, is the largest snake dwelling in Minnesota. While it generally doesn't exceed 6 feet in length, specimens more than 8 feet long have been recorded. These yellow-bodied snakes have several dozen dark brown blotches on the back and sides. The black rat snake can also reach over 6 feet in length. The large-bodied western fox snake can reach nearly 5 feet in length. Its body color ranges from yellow to dark brown, with dark blotches that become tail rings.